Aluminum ramps are strong and durable yet light in weight. They offer many advantages over the traditional wood or concrete ramp. Portable, easily moved to a new location. Durable, will last many years. Slip resistant high traction surface. 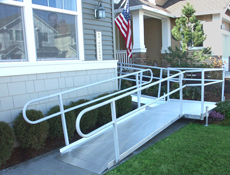 Aluminum ramps are available in a wide variety of styles and configurations, and are lifetime guaranteed. However, for ramps to match existing structures and landings, picketed and wood tread ramps can be visually pleasing with a lower initial investment. The modular ramp system is strong, durable, portable, flexible, and affordable to make it the best alternative to provide quality, functional wheelchair access to many areas. These modular, all aluminum, wheelchair ramps are ADA compliant and can be used for residential and commercial applications.